The helicopters crashed in a residential part of Mosul. CNN's Walter Rodgers says one of the helicopters may have been facing ground fire. The First Marine Expeditionary Force receives the Presidential Unit citation for heroism. (CNN) -- Seventeen U.S. soldiers were killed, five were injured and one was missing when two U.S. Black Hawk helicopters crashed Saturday in a residential neighborhood in the northern Iraqi city of Mosul. Military officials believe one helicopter may have climbed to avoid gunfire and collided with a second Black Hawk, causing them both to crash. 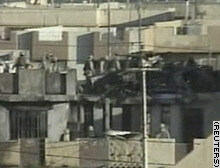 Authorities had no reports of Iraqi casualties, but a military official said the crashes set buildings on fire. Initial reports indicated that when the first helicopter rose to avoid groundfire, it "caused a rotor strike with the second helicopter," a military source told CNN. The two UH-60 Black Hawks crashed at about 6:30 p.m. (10:30 a.m. EST) in the western part of the city, Col. William Darley said. He said soldiers from the 101st Airborne Division, Iraqi police and Iraqi firefighters were on the scene. The deaths brought the number of American soldiers killed in the Iraq war to 422. Of those, 283 have died since President Bush declared the end of major combat operations on May 1. This week, two U.S. divisions launched operations aimed at disrupting the insurgency and the steady stream of deadly attacks. Earlier Saturday, one U.S. soldier was killed and two were wounded when a roadside bomb that hit a convoy in northern Baghdad. The soldier killed was a member of the 1st Armored Division, which launched Operation Iron Hammer this week against Saddam Hussein loyalists and other insurgents in the Baghdad area. North of Baghdad, the 4th Infantry Division has launched Operation Ivy Cyclone north of Baghdad, and the 82nd Airborne Division's Task Force All-American is operating to the west. In the last three weeks alone, 39 soldiers have died in five helicopter crashes. • A CH-47 Chinook was brought down November 2 near Fallujah, killing 16 soldiers, many on their way to a two-week leave. • A UH-60 Black Hawk was shot down November 7 near Saddam Hussein's hometown, Tikrit, killing all six soldiers aboard. Also Saturday, the Iraqi Governing Council said Iraqis will assume power from the U.S.-led provisional authority within six months. The announcement followed the council's Saturday morning meeting with coalition administrator L. Paul Bremer. Chalabi said the U.S.-led coalition "will dissolve" and "the occupation will end" when the provisional government takes over, but the council did not mention what role or status of U.S. troops in Iraq. -- CNN Producer John Raedler contributed to this report.